The rickshaw stopped in the middle of a small square. Pierre stood speechless in front of the spectacle that was offered to his eyes. It seemed that the scenery had shifted into a surreal no-man’s land, a tale of the Arabian Nights. All the sounds and the movements of the street seemed muffled, softened, and blended in a perfect harmony. He was so moved that he forgot for a moment where he was. Such a profundity emerged from this place that it became impersonal, timeless. This place was all the places in the world, at all times, and yet, every gesture, every physical contact, every squeaking of a wheel resonated against the surrounding facades and mingled, and twirled, and rose towards the sky in one gigantic wave, like an Om! India! India! Everything here celebrates your splendor, your contrasts, your universality. Pierre was trying to imprint these emotions deeply in his heart when his attention was attracted by a wide opening between two buildings, at the end of the square, which seemed to lead nowhere. A dense mist blocked any view and the rays of the rising sun radiated, coming through the white curled mist. The movement of the crowd came and went towards that curtain which must have covered an opening to heaven, or paradise, since the faces of the pilgrims reflected peace and tranquility. Which marvellous secret laid behind this opaque curtain? Suddenly, a famous name that his mind had buried under the emotional shock suddenly reappeared in his memory and answered his question as an illumination: The Ganges! 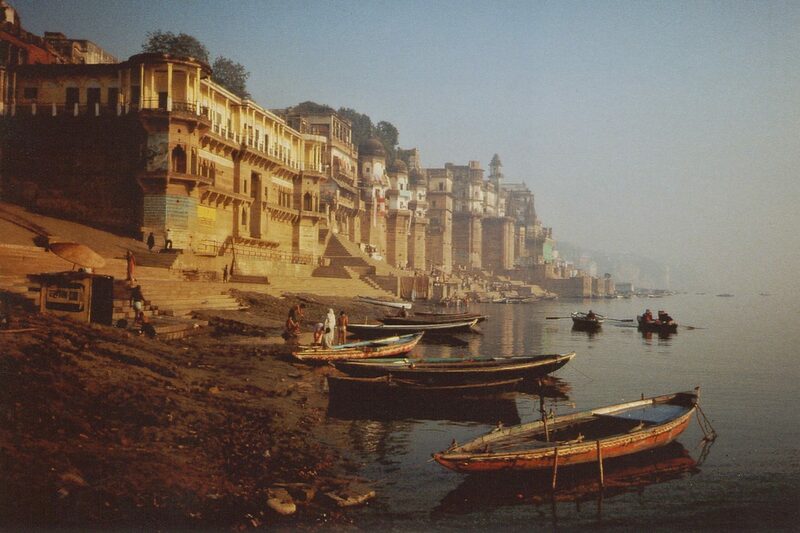 He went to the river and descended the first steps of the ghat. He was greeted by a tidal wave of life and light, of smells and sounds. Below, the sacred waters moved slowly through the mist and the sun flooded everything. He walked straight ahead, as if hypnotized, asphyxiated. The smell of spices mingled with watery scents invaded the air, and religious songs rose to the sky, punctuated by the ringing of the bells and the pleading of beggars. He walked through a royal road, and a hedge of deformed bodies, with outstretched hands, appeared as he passed. He was soaked with so much life, drunk from so many cries, dazzled by so much light. His senses had been so overwhelmed that he was shaken and began sobbing. An intense happiness ran through his body and he suddenly felt an impulse to fall to the ground to embrace the ground of this temple that so magnificently celebrated the omnipotence of life. Everything had become calm, and Pierre was gazing at the Ganges, the ghats, the multitude of large, dilapidated umbrellas under which the priests read the sacred texts. Everywhere, people were bathing, purifying their bodies, reciting their prayers, practising their rituals, then washing themselves, cleaning their clothes, rinsing, dressing, shaving, transforming the river into an immense bathroom. Farther on, the crematory pyres waited to devour the dead with their flames, while the dogs searched the warm ashes in search of some food. On the steps, banners of multicolored saris dried in the sun. Everything was beautiful, and especially the sight of the palaces lined up along the ghats, extending beyond the very end of the curve of the river until they disappeared in the mist. The more he looked, the more beautiful it became. His heart expanded and an infinite joy enveloped him. He saw as in a painting and the landscape reached the perfection of the works of the greatest masters. The Ganges, the alignment of the palaces, the old wooden boats, the pilgrims, the colours of the saris, the scene froze and an indescribable emotion took possession of him.